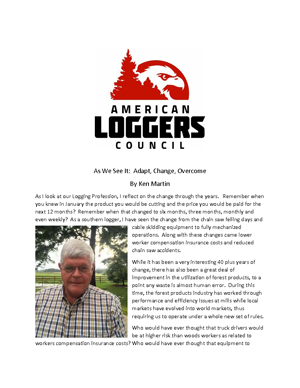 American Loggers Council incoming President sets forth a vision for all of our nation’s logging businesses. Each must have a vision and clearly understand our economy at all levels. To survive, we must adapt to a changing business climate, make changes and investments in our businesses, and improve our opportunity to overcome obstacles in our way and secure a brighter future. ► Click here to view full document.